Back in my college days, I loved anything flavorful that could be made cheaply with few ingredients in little time, especially this recipe. In its original form, taught to my friend Joan by some guy named Sandy (who still owes her $20), the onions and garlic were fried until black and crispy, then tossed with pasta. I didn’t see the point of essentially burning the vegetables, so sautéed my onions and garlic to light golden. Simple, cheap, and filling, I fed many a friend on pasta a l'olio using just yellow onions, dry garlic, oil, and pasta. 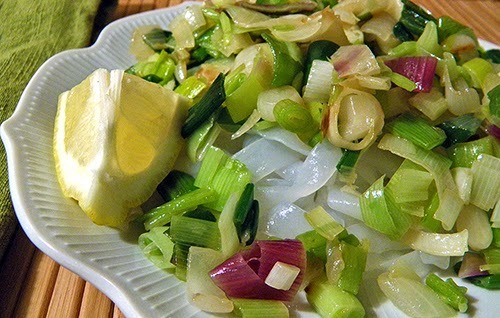 Lots of spring onions, young leeks, and green garlic in our April CSA shares reminded me of this recipe. It’s even better with fresh spring produce--and real olive oil. In my college years there was only one high-protein pasta, called Super-roni. Nowadays there are many more healthy pasta options. Sadly, the toothsome Super-roni is no longer available. These days I mostly use Miracle Noodles, made largely of soluble fiber from shiritaki mushrooms. They’re gluten-free, virtually carb-less, and low calorie. More similar to rice noodles than wheat, their texture is quite chewy and might take getting used to. They don’t contain significant protein. But the high fiber, low calorie aspect does make them more palatable. 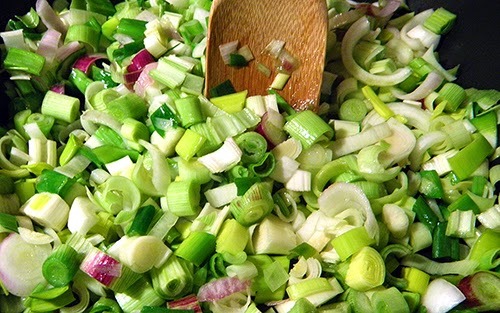 Use any combination of spring onions, leeks, or regular dry onions. The more variety, the better the taste, and the more color and texture. A few cloves of garlic (or more than a few) can be substituted for the green garlic. 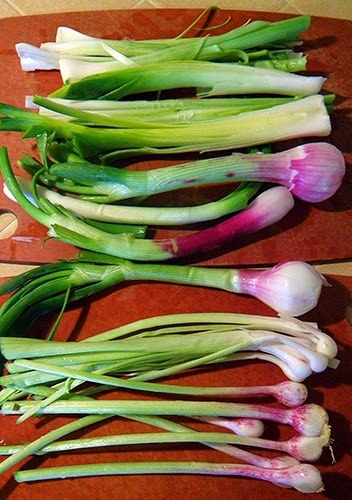 Remove roots and tough ends from spring onions, leeks, and garlic. Split leeks in half lengthwise to scrub out hidden dirt. Cut onion bulbs in half, but leave green parts whole. Slice onions and leeks about 3/8” thick. 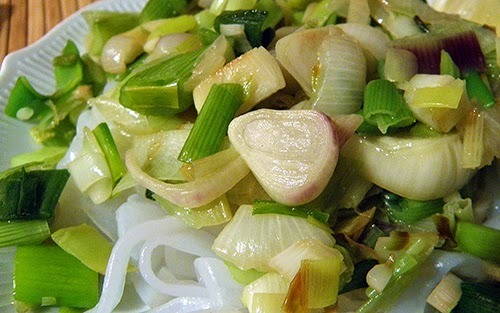 Slice green garlic about ¼” thick. 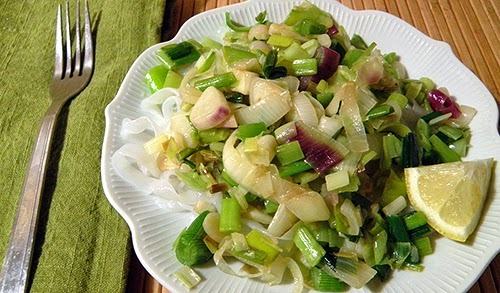 Keep onions and leeks separated from green garlic. You will have about 6 - 7 cups onions and 1 - 1 1/4 cups garlic. Check the cooking time of the pasta. Most require several more minutes than the onions, which will cook a total of about 10 minutes. Put water on to boil and start cooking pasta accordingly. If using Miracle Noodles, rinse them thoroughly now (the strange smell will dissipate when cooked). Heat the water now, but add Miracle Noodles a couple of minutes before the onions and garlic are done. Preheat an electric frying pan to 325 degrees. Coat the bottom with about 2 tbsp. oil. When up to temperature, add onions and leeks. Sauté, stirring constantly, for about 2 minutes, until onions start to get limp and volume is reduced. Add garlic and continue to sauté, stirring frequently, until onions are cooked throughout. You may brown them slightly if you prefer. Add a little more olive oil as needed to prevent sticking. Drain the pasta and distribute in plates or bowls. Top with a big scoop of onions and garlic. Serve with salt, pepper, and lemon as desired. Adding ½ tsp. or less of olive oil will bring out olive flavor of the cooked oil.